If you’re in the market for an all-latex bed, you’ll definitely want to follow along with me today as I review the Spindle mattress. Not only is this bed built with three layers of soft, all-natural latex, but it’s also adjustable, so you can tinker with the different sections for true personalized comfort. But how exactly does the Spindle sleep? I won’t know until I put it through my series of rigorous tests, which will help me figure out how it feels and, most importantly, whether or not it might just be the mattress you’ve been waiting for! 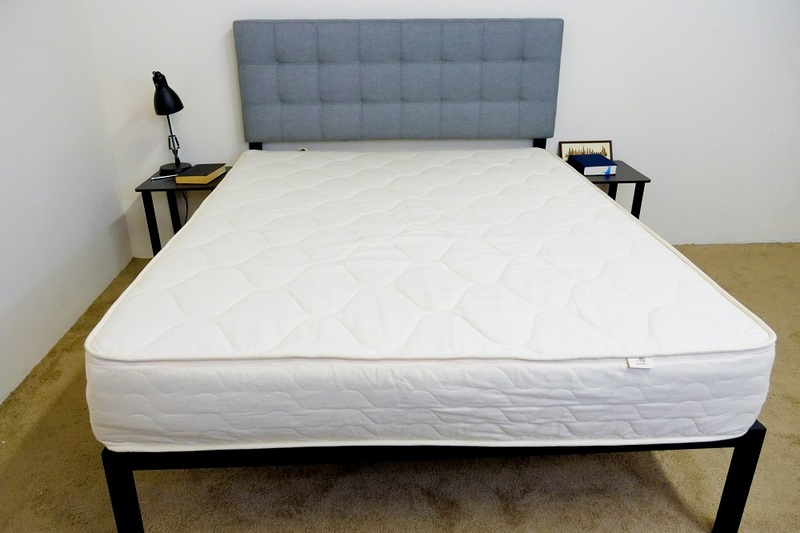 Continue reading below for my full review of the Spindle mattress. Don’t have time to read it all? Click here to skip to the bottom and check out my review summary. As I mentioned up top, the Spindle is an adjustable bed, but unlike others you might’ve seen on the market. The way it works is this: you log onto the website, answer a few questions (detailing your height, weight and sleep preferences) and the company sends you a customized parcel of three latex layers, which you’ll then assemble at home. If for any reason the combo of sections you receive isn’t to your liking, Spindle is happy to swap out layers until you’re 100% satisfied. 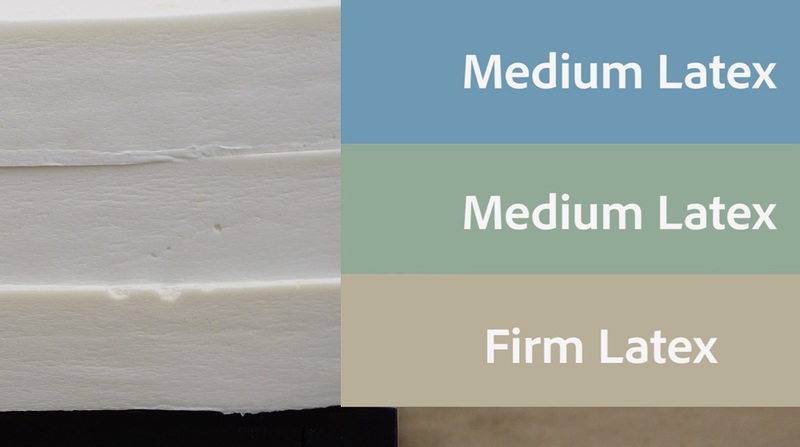 For the purpose of this review, I’m taking a look at the brand’s “medium” orientation, so received two “medium” latex layers and a single “firm” one. These sections came in three separate boxes—I unloaded them and then layered them per Spindle’s specific ordering instructions. You may have heard some complaints about setting up the Spindle and I won’t lie and say the build was the easiest thing in the world, but it was pretty neat to construct a bed tailor-made to my preferences. You may have checked out a few Spindle bed reviews but if you are looking for more on this assembly, check out my Spindle setup video. But enough about all those logistics, let’s jump into this bed and see how the design works! Comfort Layer – The comfort layer in this orientation is comprised of a 3” layer of medium natural latex. This material is soft yet quickly responds to pressure, ensuring that the sleeper will enjoy some nice pressure relief without feeling stuck in the mattress. Transition Layer – Directly below the comfort layer, you’ll find another 3” of medium natural latex. In addition to extending the comfort of the top layer deeper into the mattress, this section also works to transition the sleeper into the bed’s firm foundation. Interested in learning more about latex? Check out my post on Dunlop vs Talalay Latex. After taking a look at the construction of the Spindle, let’s chat about the firmness and feel. I started off by applying light hand pressure to the mattress and found that I was experiencing that classic latex feel of bounce and coolness. Pushing in further, I was able to sink in for some pressure relief, but never so much as to feel stuck in the bed. The trio of latex layers really worked to press against my force, lifting me up and out of the structure. Since folks of different sizes and body types are going to feel firmness differently, I decided to enlist three other testers to help me determine the firmness of this bed. We each took a turn lying on the mattress, shared our individual firmness ratings and compiled them on the graph below. While feel is always going to be a personal thing, this will hopefully give you a better sense of the firmness range you can expect from the Spindle. Though there was a bit of discrepancy among my testers, we ended up landing on an average firmness rating of 5.6. When compared to the industry standard of 6.5 for medium firmness, it’s clear that this bed is definitely on the softer side. I personally gave the bed a 6. While you’ll experience some slight sinkage through the softer top layers, because the mattress is entirely built of latex, you’re likely to feel as though the material’s bounce is keeping you positioned on top of the bed as opposed to in it. Rather than just describing how the Spindle feels, I thought I’d give you a visual representation of where you’re likely to feel pressure points form while lying on top of it. Back – Lying on my back, I felt as though my weight was pretty evenly distributed across the surface. I detected some nice pressure relief at my lower back, with the soft latex comfort layer filling in the space at my lumbar region. While I did sink in a bit here, I definitely felt as though I was on top of the mattress and found it easy to change positions. Side – As you can clearly see in the graphic, once I rolled onto my side, I began to feel the formation of pressure points at my shoulders and hips. However, I wouldn’t say this tension was so extreme as to leave me feeling uncomfortable. Though you aren’t going to get a ton of cushiony relief at your shoulders and hips—typical problem areas for side sleepers—the latex design is gentle and does provide quality comfort to these body parts. Stomach – Though the graphic doesn’t necessarily show this, I did feel pressure forming at my chest and hips in this position. 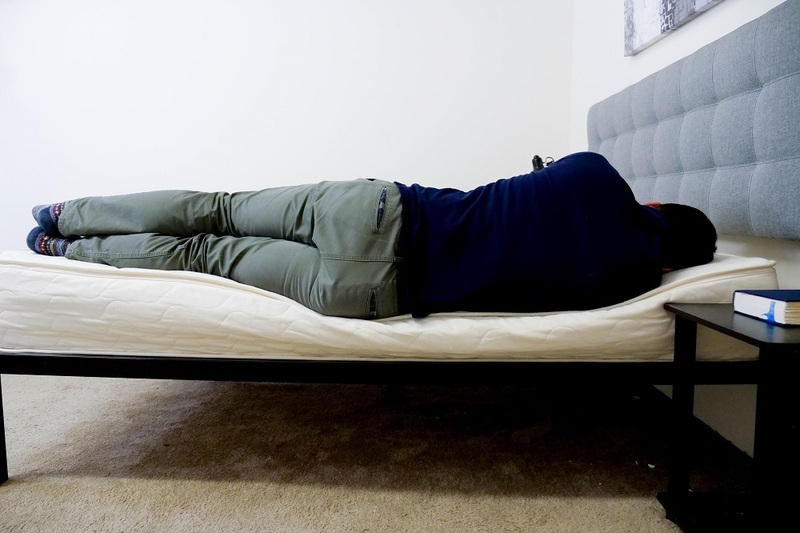 Stomach sleepers tend to prefer firmer mattresses as they’ll keep these areas lifted and in a nice alignment, so it’s not surprising that I’d feel some discomfort here as I was testing the medium firm option. Now, let’s chat a little bit about motion transfer, or the amount of disturbance you’re likely to feel from one side of the bed to the other. This test will be of particular interest to anyone planning to share their bed with a partner, as it’ll let you know whether or not your bed mate’s movements are going to ruin your beauty sleep. 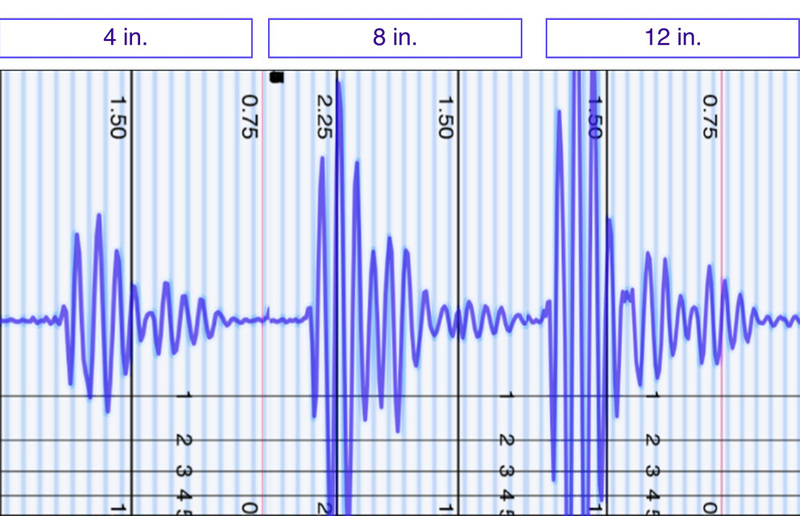 As you can clearly see in the graphic above, these are very high motion transfer readings. I’m not too shocked by these results as latex is an extremely buoyant material, especially when combined exclusively with more latex. 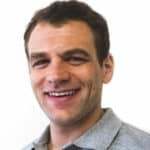 While the responsiveness of the structure is going to be fantastic for support and changing positions, it does unfortunately mean that you’re likely to feel your partner’s every toss and turn. Check out my post on the Best Mattresses of 2019! The next test I’m going to run is all about sinkage, the factor that’ll let you know whether you’re going to feel like you’re sleeping “on top” of your mattress or “in” it. To demonstrate this sinkage, I placed four balls of varying sizes and densities (a 6 lb medicine ball, a 10 lb steel ball, a 50 lb medicine ball, and a 100 lb medicine ball) on the bed and measured how much they compressed the surface. When compared to other mattresses on the market, these are fairly average results consistent with the typical feel of a medium firm bed. What this means is that you’re going to experience a satisfying balance between pressure-relieving sinkage and support. And as I’ve mentioned throughout this review, because this is an all-latex bed, you’re likely to be positioned “on top” of the mattress as opposed to “in” it. 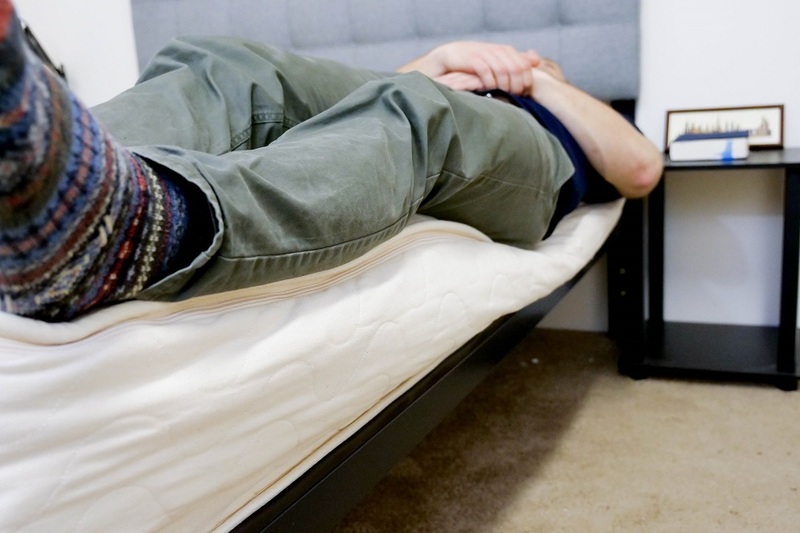 When I initially stretched out on the side of the mattress, I felt about as supported as I did in the center. However, as you can see in the photo, once I scooted closer to the edge, I began to experience some pretty deep compression through the top latex layers. While this didn’t necessarily make me feel less secure here, it is something that I noticed. Turning to my side, I began to feel this compression even more intensely. You’ll note some of the sinkage we discussed earlier in the review, particularly at the hips and shoulders. Though I didn’t feel totally secure in this position, I still felt solid enough to where I wouldn’t roll out of the bed. In this position, I wanted to simulate what it would feel like to be sitting on the bed in the morning when you’re lacing up your shoes and getting ready for the day. A lot of foam mattresses experience severe compression in this position, and the Spindle was no exception. Sleep Trial: 365 Day Comfort Guarantee. They ask that you sleep on the mattress for at least 30 days, after which point if you don’t like it, they’ll work with you to send you different layers to achieve an improved feel. Shipping: Free, arrives compressed in at least three different boxes. Shipping is available to anywhere in the United States and Canada. I recommend assembling the bed with a partner as it’s a bit laborious. 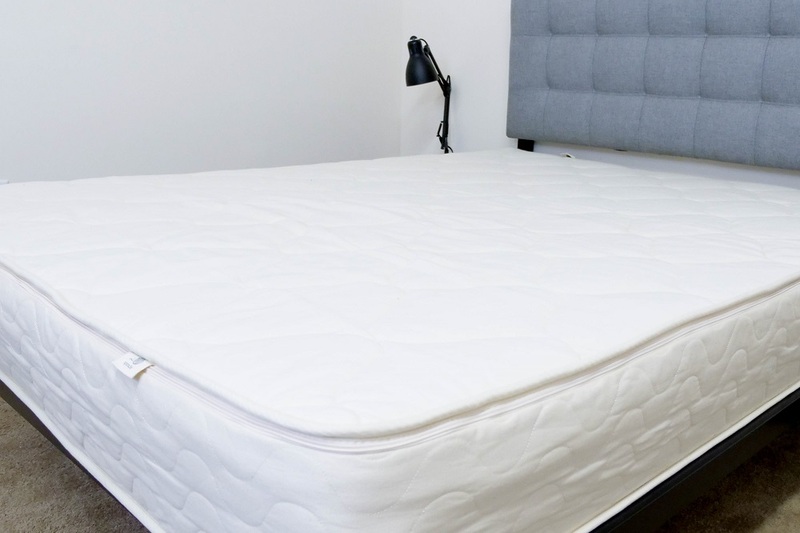 If you’ve checked out enough Spindle mattress reviews and are convinced the Spindle is the right mattress for you use the coupon code SLEEPOPOLIS to save $200! 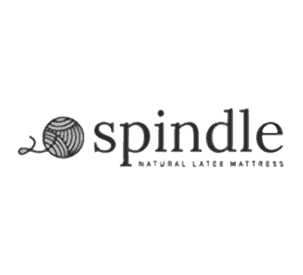 IS THE SPINDLE MATTRESS RIGHT FOR YOU? Natural materials – From the organic cotton and wool batting in the cover to the all-natural latex used throughout, one of the Spindle’s standout qualities is its eco-friendly construction. This would make it a great option for anyone interested in getting their hands on a green mattress. Bounce – As I mentioned a few times throughout this review, the Spindle is a very bouncy bed, thanks to its all-latex construction. So if you’re on the prowl for a buoyant structure that’ll keep you lifted on top of the bed, it could be a fantastic pick for you. For more information on the Spindle, check it out here!